Another adventurous cross-country rally ended with Rafał Sonik being awarded the third World Cup in his career. Driving through the wilderness of six countries, this Pole covered the distance of 230 km of desert without navigation. Following barely visible trails left by his competitors, he got entangled in barbed wire, crushed into a cow, push started his vehicle in the mountains of Sardinia, covered 250 km of Sahara without drinking a drop of water and won the prologue. Then he entered the podium in general classification with motorcyclists. To sum up, it was a very emotional period. Dos Sertoes – one of the most favourite events in Rafał Sonik’s calendar once again turned out to be lucky. The captain of Poland National Team won the FIM Cross-Country World Cup in Brazil for the third time, with the last but one round before the end of the season being decisive. Morocco was supposed to serve as training to prepare Sonik for Dakar, but it turned out to be yet another spectacular success. Besides the World Cup, Rafał Sonik has also a few more achievements to be proud of. He became the first quad driver to get the “FIM Rally Crown”, i.e. win every rally listed in the calendar for this cycle. It was possible thanks to his first victories in Abu Dhabi and Egypt. What is more, he became the first quad driver to finish the World Cup on the podium together with motorcyclists in the general classification. SuperSonik managed to achieve it during the Pharaons Rally, where he had the honour of standing on the podium twice. However, the award that brought the biggest smile to Rafał Sonik’s face was the award for the best veteran of the general classification of quad and motor drivers in the Morocco Rally. – laughed the best quad driver in the world. The Abu Dhabi Desert Challenge is, after Dakar, the rally that Rafał Sonik had been dreaming to win for years. 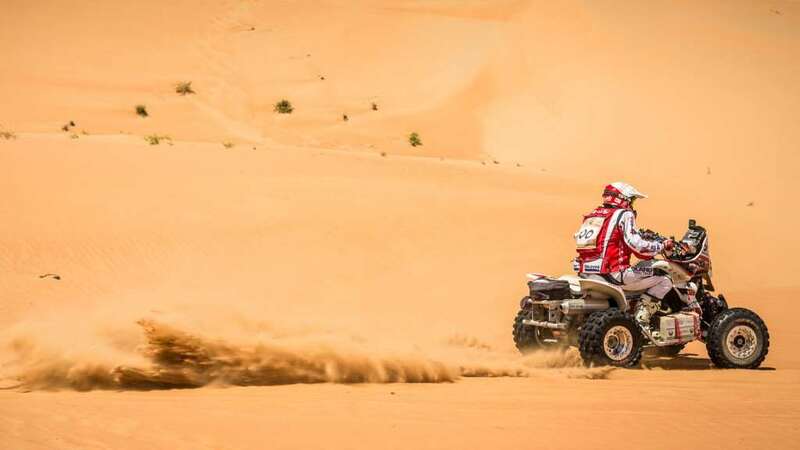 This particularly difficult race on the sands of the United Arab Emirates is one of the most prestigious rallies in the entire FIM and FIA season. In 2014, this race turned out to be a lucky one for Sonik – after four years of trying, he finally achieved victory. – said the quad driver at the finish line. However, this victory was not the easiest one for the captain of Poland National Team. On the first day of the competition he and Jakub Przygoński gave first aid to a heavily injured motorcyclist. On the second day, it was Przygoński who had to be taken away in a helicopter. A spinal injury eliminated him from the competition for an entire season. But the rally must go on and Sonik was the leader among quad drivers from the very beginning. He couldn’t avoid falls himself, as due to rain, the condition of soil was a big challenge. – Sonik commented after one of the stages. This edition of Abu Dhabi Desert Challenge also surprised us with an absolutely spectacular common race of motorcyclist and quad drivers. Although this solution was very appealing to the spectators, Sonik painfully experienced various downsides of this idea. Fortunately, everything ended well and Sonic won four out of five stages, achieving his first victory in Abu Dhabi. It was the dream beginning of a season and a great source of joy from driving on unusual grounds. – Rafał Sonik summed up. Two victories achieved in the past years in the Sealine Cross-Country Rally made Rafał Sonik the front runner in Qatar this year. But the Pole, carried on the wings of victory in Abu Dhabi, had to stomach the disappointment as his most dangerous rival in the World Cup, a local quad driver, Mohamed Abu-Issa, turned out a tiny bit earlier on the finish line. This event made the Pole want to make up for the loss so much that he got lost twice, losing another thirty minutes to Abu-Issa. He couldn’t make up for that loss anymore and it was the Qatari who won in his motherland for the first time. Nevertheless, Sonik remained the leader of the World Cup and he knew that the advantage had to be regained in the next round of the World Cup – the Egypt Rally. The second in a row victory in the Sardegna Rally showed that you should never give up and fight for your rights. Rafał Sonik changed the course of this rally’s events by appealing against the imposed penalty and regaining the deserved leading position. He did not let his greatest rival, Mohamed Abu-Issa, win and made a step towards winning the third World Cup. The Sardegna Rally started unusually with… a draw. During the prologue, Rafał Sonik and Sebastian Souday covered a short super special stage scoring the same time and tied for first place. The first day of a real competition was supposed to put the Pole in the leading position, but instead it put him through a real nightmare. – he said at the finish line. Despite such serious problems, the captain of Poland National Team lost only slightly more than three minutes to Mohamed Abu-Issa, who took the lead. From this point, Sonik was trying to get back on the horse. The penalty imposed by the scrutineers or getting entangled in barbed wire didn’t help much. Fortunately, after Sonik protested against the penalty, the scrutineers accepted his appeal and gave the unjustly deducted minutes back. This decision allowed him to start the last stage as a leader and gain his third victory this season. Himalayan climbers reach the crown of the world, so rally drivers can reach for the unofficial “Crown of World Cup Rallies”. At this point, all Rafał Sonik had to do was to win the Pharaons Rally. Sahara turned out to be kind as our quad driver not only easily won in his class, but also came as third in the general classification with motorcyclists. Rafał Sonik showed what he can do during the prologue in El Gouna at the coast of the Red Sea. The Polish quad driver even managed to outrace a motorcyclist on a short stage. At later stages, he was only proving his abilities while competing against much faster single-track vehicles to stand on the podium twice at the end. However, also this time the joy at the finishing line required Sonik to put up a fight against different kinds of difficulties. The second stage of the competition was the most dramatic. “After about 100 km of the special stage I lost almost all my navigation instruments: GPS, Sentinel and Speedocup. All that was left was the metrometer and the roadbook. I think it was the first time when I felt so frightened and nervous while driving through a desert. There were no landmarks around and heat was pouring from the sky. I had no idea where I was or where I was going to. Nothing and nobody were in sight, ” said Sonik, who covered 230 km of the special stage thanks to tracks in sand and assistance of a motorcyclist met on the way. As it turned out, driving through Sahara may not only give you a shot of adrenaline but also ensure some unforgettable experiences. “This was amazing: gentle sand dunes and picturesque sand waves stretching to the horizon. An endless space and only two trails of motorcycles in front of me. I think it was the most beautiful part of Sahara I’ve ever been to. What’s more, we’re resting at a campsite near an oasis where caravans have been stopping for centuries, but where we are now, there is sand, rocks, wind and infernal heat. There’s no pleasure in it,” said the racing driver having completed one of the stages. At the finish line, which was traditionally located by the pyramids, there were many reasons to rejoice at. “I can’t recall a race in which a quad would be ranked this high in the general classification of a FIM rally,” said SuperSonik after receiving awards for the first place among quad drivers and third among motorcyclists. Next 20 points made his position of a World Cup leader even stronger before the approaching the Sardegna Rally Race. Rafał Sonik arrived in Brazil planning to repeat his success from 2010, when he surprised everyone by winning the competition as the first European in history. He almost got what he wished for. The very close battle against a local stager, Robert Nahas, ended with Sonik being second. Nevertheless, this race gave him his third World Cup, which, yet again, was awarded during Dos Sertoes. The captain of Poland National Team started in the best possible way by winning the first stage. The quad driver was experiencing problems regarding vibration of wheels from the very beginning, and the wheels were supposed to last until the end of the rally. Despite this harmless, but burdensome failure, assuming a safe-driving approach, Sonik immediately took the lead. Unfortunately, on the second day, he made a navigation mistake due to inconsistencies in the roadbook, which put him six minutes behind the leader and gave him the seventh place. “I had to take this day on the chin and move on. I’m not planning to give up. I’ll be pushing myself until the end,” Sonik said and kept his promise. During the following days he was among the first three drivers and achieved the best time in the past two days. This brought him to the finish line at the spectacular second position, which meant that he won his third World Cup. “I was covering a very fast right turn when a cow jumped onto the road from a slope and hit me with its side. We veered away from each other and I almost veered off course. I was driving at about 90 km/h, so it is very lucky that the cow did not run to the middle of the road and slightly turned instead. I have very bad memories about such incidents because my friend died in a similar situation in Dakar, so it cost me a bit to get a grip of myself when this happened. From that moment on, I was driving really carefully,” he commented. The hard-earned second place made Sonik happy, but, as every other sportsman would say, it could not be satisfactory. The rally driver announced that he will come back to Dos Sertoes and fight for the first place in the following season. It was the second year in a row in the OiLibya Rally where there was no one stronger that Rafał Sonik. He won six stages and a few times found himself in the lead in the general classification with motorcyclists. During the Sahara Rally, he proved that he was one of the best quad drivers in the world and during the next Dakar Rally he would be a demanding competitor for local participants. The best person to tell you how pleasurable it was to compete in the Morocco Rally is Rafał Sonik himself: “I was overtaking at corner entries and exits, uphill and downhill, on sand dunes and in narrow canyons. Today I really enjoyed passing by motorcyclists, although those were rather difficult and demanding manoeuvres. Most of the motorcyclists were clearly surprised that there was a quad passing by like an express at full speed. I am also happy that there were 60 motorcyclists in front of me at the start and in the general classification I was eighteenth and arrived at the finish line with them. In the last two days, Sonik arrived fifteenth twice with motorcyclists and this was the place he got in the general rally classification. The OiLibya Rally was not, however, only an attempt to race motorcycles, but also a test before Dakar. Sometimes, it was a very risky test. “After setting off and covering a few kilometres I wanted to take the first sip from the hydration system, but it was impossible. I stopped and repositioned the hose that was going around my shoulder instead of above it. But it didn’t help. I decided to carry on and check whether I would start getting dehydrated, especially given that I had drunk a lot of water in the morning and evening before the special stage. First, some weird muscle pain kicked in. Then, it started messing with my head, so I don’t think it’s possible to drive much further than 250 km which I covered in this temperature,” the quad driver said about his experiment.